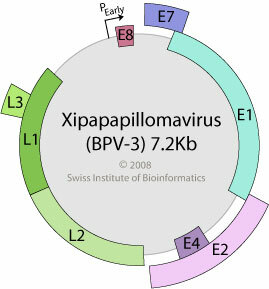 Circular dsDNA, about 7 kb in size, associated with cellular histones. A characteristic E6 ORF is absent. Only one strand of the genome is transcribed and yield two classes of proteins expressed by alternative splicing: a) Early Proteins: non-structural regulatory proteins (E1-E7). ASSOCIATED DISEASES Cause true papillomas on the cutaneous or mucosal surfaces of cattle .